Bette Midler, Barry Manilow, Neil Diamond, Barbra Streisand: The last days of the great American showpeople. Photo illustration by Lisa Larson-Walker. Photos by Mark Davis, Kevin Winter, Jeff Fusco, and Stephen Lovekin from Getty Images. The day of the last show in his “One Last Time” tour, Barry Manilow turned 72. “When my grandfather was this age, the best he could do was bring up phlegm,” he said that night from behind a piano at the Barclays Center in Brooklyn, doling out a canny folksiness that’s served him since the 1950s, when he was a skinny kid playing accordion favorites for his parents up the street in Williamsburg (which Barry correctly described as “now all fancy schmancy”). In many ways, Manilow is still playing that skinny kid, getting loving ovations simply for hitting high notes, and eliciting hoots and whistles from female fans for the kind of PG-rated come-ons that everyone always knew weren’t actionable. It’s all just a show. But what was once mere easy listening, an exemplar of irredeemable uncoolness, has taken on weight and poignancy with time. A once dominant, very American-melting-pot mode of popular entertainment is about to pass into history. These are the last days of the great American showpeople. How will we remember their bellow-to-the-rafters, bear-witness-to-my-talent era? Twelve days after Manilow bowed out with a reprise of “Can’t Smile Without You,” his onetime collaborator Bette Midler took the same stage at the Barclays. Three months prior it was Neil Diamond who came home to the venue, singing nostalgically about the “Brooklyn Roads” he grew up in—the same neighborhood (and high school, and showbiz dreams) that nurtured Barbra Streisand, who inaugurated the Barclays Center in 2012. 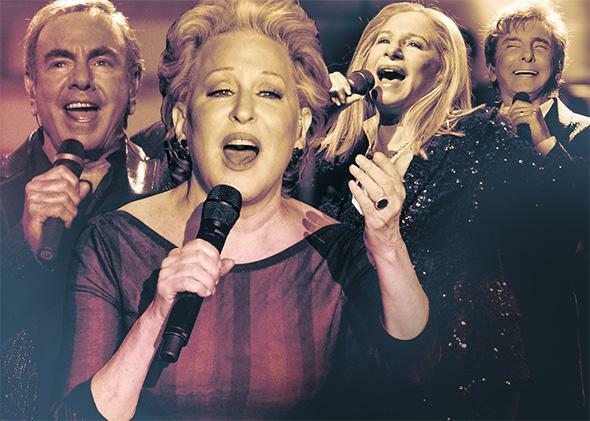 Three of the four were born in Brooklyn (Midler was raised in Hawaii by New Jersey–born parents but moved to New York at the age of 19), all are Jewish, all were crucially born during the years of World War II, and all have been crowd-pleasing showpeople for half a century. With post–hip replacement Manilow being coy about future tours, the 73-year-old Streisand typically mum about public appearances, and the 74-year-old Diamond for the first time noncommittal about continuing his 45-plus years of road-hogging, their time of arena dominance is collectively winding down. Forget the knee-jerk jokes and parodies, the gossipy tittering about face-lifts and remarriages. They once were among the biggest stars we had going. They dominated radio, Broadway, Hollywood, television, concert halls, and arenas. Fifty years later they still sell plenty of tickets and albums, and though their catalogs now litter dollar bins—throw a copy of The Rose in the air at your local used record store and you’ll hit Streisand in that Superman T-shirt—it’s only because of how many of their damn discs the public once consumed. They operated at the intersection of jazz-age piano bar crooning, variety show razzmatazz, mainstream AM pop, and Borscht Belt Yiddish theatrics. (All four did turns in the Catskills, with Diamond even signing his first ill-advised performance contract there during high school summer vacation.) And though they each adapted to trends in rock, folk, disco, and whatever other sounds they could craftily co-opt, it was always in opportunistic service of their own chart-topping agendas. And they were never, ever cool. They weren’t disaffected rebels, weren’t looking to reshape the culture in their images, or start a movement. Well before they became stars, they had their sights set on the mainstream. Diamond churned out workaday pop songs for Tin Pan Alley, Manilow wrote fiendishly catchy commercial jingles for the likes of Coke and McDonald’s, Midler hoofed it in off-off-Broadway productions, and the teenaged Streisand auditioned her way onto stages and shows. They came of prominence as the 1960s counterculture subverted the aspirational middle-class, kids-of-immigrants-made-good culture of Frank Sinatra and Ed Sullivan—a culture that became square just as they hustled from Brooklyn to Manhattan to Los Angeles to break into it. Except for Diamond, their peak stardom was sustained through polished recordings of others’ songs—the tried and true tactic of an earlier era, even as the singer-songwriters of the late 1960s and ’70s shifted the culture. They were fueled by chutzpah and hungry for approval. They looked, talked, and even flaunted their Jewishness (unlike Bob Dylan, née Zimmerman, Diamond even toyed with taking on a more Jewish-sounding name: Noah Kaminsky); instead of diluting it they poured it into the mainstream. All four of these famously Jewish artists recorded Christmas albums, and somehow nothing could have been more normal or banal. You can still picture each of these performers, even past 70, killing it at a youth talent show. Midler’s bawdiness still seems somehow precocious, Diamond’s rock ’n’ roll still plays as charmingly second-hand, and Streisand and Manilow still bring the house down simply for hitting their notes. (Manilow even gets love for key changes.) At the Barclays, Manilow reminisced about how his grandfather gave him a standing ovation at his first appearance at Carnegie Hall, and throughout the show he and the enthusiastic audience were enacting an eerily similar, oddly satisfying exchange. Could you imagine a contemporary like Mick Jagger, or even fellow New Yorker Billy Joel—born six nonconformist boomer years after Manilow—milking the audience for head-pat approval? So they were too available, too eager to please, too ambitious ever to achieve coolness. Yet although being uncool ensured constant critical scorn, it’s also been the key to their staying power. By never being in fashion, they never had to endure falling out of it. Neither did their fans. An unsexy truth about America in the ’60s and ’70s—a truth at the heart of Mad Men—is that many people, including many young people, didn’t partake of the counterculture. Diamond actually released a de facto PSA on the perils of pot mere months after the Summer of Love, which was around the same time that Manilow was composing commercial jingles for Coke and McDonald’s. Which made them safe ambassadors for a filtered version of the new freedoms, peddling hippiedom’s greatest hits (Streisand’s Stoney End) and dime-store self-actualization (Diamond’s “I Am … I Said”) for the Ice Storm set. These are the people who made Manilow, who sang of loving and smiling and making it through the rain, into one of the top acts of the 1970s. Over the same period, they followed Barbra from Broadway to Hollywood, from Leonard Bernstein to Kris Kristofferson to Barry Gibb. And sometimes they didn’t even bother evolving. Diamond’s one of the top live acts of all time despite a set list that’s scarcely changed since Reagan’s inauguration. At his Barclays show back in March, Diamond repeated the final verse and chorus of “Sweet Caroline” three straight times—not in response to spontaneous demand, but out of a well-practiced tradition of overkill. (He performs it the exact same way every night, with the same false attempts to stop after the first run-through and the same on-cue chants for more, more.) Reliability is a large part of the appeal. Everything else changes, everything else can let you down, but there’s always that leap-to-your-feet thrill of hearing the first few chords of your favorite song. Cool fades, but “Forever in Blue Jeans” is, well, forever. Or that’s the illusion. Now that time has started to catch up to these performers, even their cheesiest ploys tend to take on a note of poignancy. And as this strand of showmanship fades along with them, the cheese feels less like pandering and more like craft—a kind of well-tuned showmanship that’s unique to this generation of performers. Consider Manilow’s between-song banter, which is as rehearsed and calibrated as his singing. Looking up to the nosebleed seats, he said, “I must look like a little dancing nose up there,” with the next song’s ba-dum-dum-dah rising in response. As he doubtless had done hundreds, if not thousands, of times before, Barry invited a woman from the front row to dance with him for a crisp 20 seconds (“Everybody give a hand for Tara from Omaha!”), the star presenting himself as accessible but in control, and doing it flawlessly. The jokes, the interactivity, the self-deprecation—such stagecraft has been passed down among jazz joints and nightclubs; Ed Sullivan and Hee-Haw; Brooklyn and Branson, Missouri. It’s a tradition of execution, of notes and elements fitting into place, and much of its pleasure comes from everyone knowing (and exulting) in the pattern. Some younger megastars have cannily borrowed from the big show playbook. Katy Perry’s cartoonish sensuality and prop-heavy showmanship owe a heavy debt to Midler, as does Lady Gaga’s act, which recently has also veered into Manilow and Diamond-esque modulations between ballads and bombast. Both artists actively court women and gay men, loyal audiences that have been crucial to the older artists’ longevity. While something of the showpeople’s aesthetic and energy may survive, there’s no way of replicating a generation of performers who emerged in that particular time and place—midcentury overachievers raised on a blend of mainstream assimilationism and irrevocable urban ethnicity. What we saw in Manilow, Midler, Diamond, and Streisand wasn’t, for all of their polish, an affect. Their acts were their lives, created out of an intertwining of popular arts that made sense for the families and neighborhoods and historical era that they came from. Younger artists are smart to borrow from these forebears, especially if they’re aiming to stick around and keep their fans for a while. But there’s no way to manufacture the innately sincere approach to both talent and salesmanship of the showpeople. What may truly be lost, or what may truly be fading, is a belief that talent wins out. That talent, delivered with a modicum of flair, might be enough. That with a voice like Streisand, the musicianship of Manilow, the songcraft of Diamond, or the singing-dancing–stand-up triple threat of Midler, you could reasonably expect to make it. It’s hard to imagine any of them achieving the same level of success in today’s world. Likely they’d be churning out hits for Pink or Kelly Clarkson, or enjoying runs on Broadway, collecting the occasional Tony and making a decent living. But forget The Way We Were, The Jazz Singer, or Beaches; forget the variety shows and the rhinestones, the SNL parodies. Maybe they’d captivate us for a season of The Voice or inspire a standing ovation from Howard Stern on America’s Got Talent (a word that now denotes a repository for marginal acts). But that’s Susan Boyle territory, not Hollywood superstardom. It’s certainly not 50 years of arena sellouts. Which is what she did, and what they all do. Midler sang the hits, sprinkled in a few of her less-famous favorites, and ended on arguably the biggest song that any of these showpeople ever recorded—that cover of a Lou Rawls tune that generations of grooms have guiltily danced with their mothers to on their wedding nights, and that Bette has sung nearly as often. Yet she cried as she dedicated the song to her fans, and of course she nailed it. And it doesn’t matter how rehearsed it all was. True showpeople develop a routine and practice to perfection, supplementing it with style and flashing “a beautiful smile to hide the pain.” And they always, always finish strong. Correction, July 7, 2015: Due to a production error, this article’s photo caption misidentified Barry Manilow as Neil Diamond and Neil Diamond as Barry Manilow.